Zola, Maradona, Sardinia ~ Sardinia Baby! Yes, undeniably Sardinia's most famous sporting export, Zola was born in 1966 in the small town of Oliena, famous for its 'Nepente Cannonau wine'. He signed his first professional contract with Sardinian team Nuorese in 1984. He then moved from Sassari to Sardinia's oldest club Torres in 1986. The big time came in 1989 when he signed for Napoli in Serie A (the Italian Premiership) and playing alongside Diego Maradona. 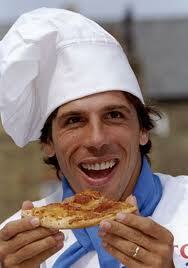 The young and talented Zola scored two goals as Napoli won the Serie A title in 1990. "I learned everything from Diego. I used to spy on him every time he trained and learned how to curl a free-kick just like him". "Ninety-five per cent of my language problems are the fault of that stupid little midget"
In 2003 he moved back to Sardinia to join Cagliari. Within a week of his move Stamford Bridge was bought by Roman Abramovich. Wanting Zola back at Chelsea it's reported that Abramovich tried to buy the Sardinian club when Zola refused to renege on his verbal contract with them. Despite Zola spending most of his time away from the Island, Sardinia is no more famous for it's "integrated open source enterprise portal platform and content management systems".